People like to blame technology for destroying business, but there’s a dark secret to why many businesses fail. Uber isn’t what’s hurting the Taxi Business. Amazon didn’t decimate the book store. Those industries were ruined by not listening to their customers and not changing with the times. Good or bad, the experiences your customers have with your comic book store determines if they come back. Your customer experience helps distinguish your store from competitors. Customers who have the best experiences spend almost 1.5 times more than those who have the worst. So what’s one of the best approaches to customer experience improvement? The answer: investing in technology. In fact, 25% of companies that invest in technology say their main goal is to create better customer experiences. These are a few ways how technology improves the quality of customer experiences in your comic book shop. Brick and mortar comic shops have a certain charm that’s impossible to replicate. But the truth is you don’t have enough resources to stay open 24/7. So, if you’re relying solely on your brick and mortar store, you’re limiting your business. Customers have a lot of questions, and you can’t always be there to answer them. Plus, with hectic work schedules, customers can’t always make it down to the store when they would like. This is where technology changes everything. Your website should serve as an extension of your store. It’s like an office that’s open all day, every day. If a customer wants to make a change to their subscription list after reading an article on Bleeding Cool, they can do that with an online comic book subscription platform that customers can visit any time of the day. The easier it is for customers to get what they want, the more they’ll come back. The average person now spends 5 hours on their smartphone every day. They’re used to the convenience mobile devices offer. Customers desire the convenience of managing their pulls on the go. They want to be able to whip out their phone and make a payment during their break at work, or in line at the grocery store. Comic fans will turn to shops that can provide them this level of convenience. 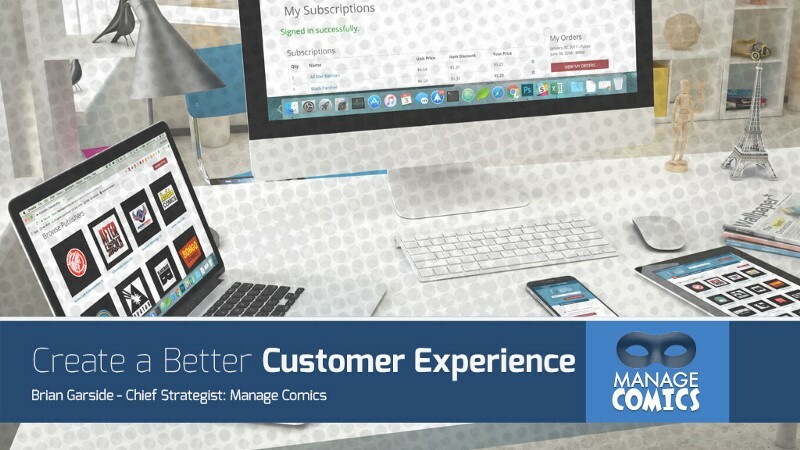 Manage Comics comic subscription software enables your customers to manage orders from their mobile devices. With this technology, your customers can carry your shop right in their pockets, everywhere they go. You can create delightful experiences for your customers without forcing them to step into your store. Customers like to feel like they’re in control. Your website is the key to generating this type of experience. You can do this with a fast-loading website that’s easy to navigate, features a wealth of knowledge, and has an online subscription platform. When you offer this, you empower customers to fulfill all their needs in one place. They don’t need you to hold their hand throughout the process. Instead, they want you to give them the tools to figure it out themselves. But by empowering your customers to help themselves, it opens up more time for you as well. You can focus on other aspects of your business since technology takes care of the rest. Netflix did away with customers most hated inconvenience — late fees. Uber let you know exactly where your cab would be, and how much it would cost to get there. Amazon used an amazing search and recommendation engine to drive more sales, and added the convenience of same day delivery. Netflix, Uber, and Amazon’s competitors could have used technology to get ahead, but grew complacent over the years and didn’t see the need to change until it was too late. Technology leads the way for customer experience improvement. In the Internet age, customers have many options to choose from. As a result, you must offer something unique to your customers. Prioritizing the customer experience can help you build a competitive advantage. Plus, empowering your customers to find answers to their own questions makes your job easier as well. Are you ready to improve the experiences customers have with your store? 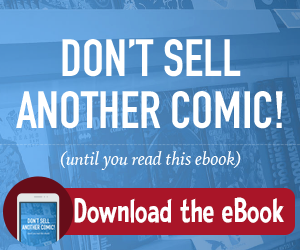 Learn more about how you can improve your technology with an online comic book subscription service. We’ll show you how your customers can manage their own lists, how they will find more comics, and ultimately how you will make more money. 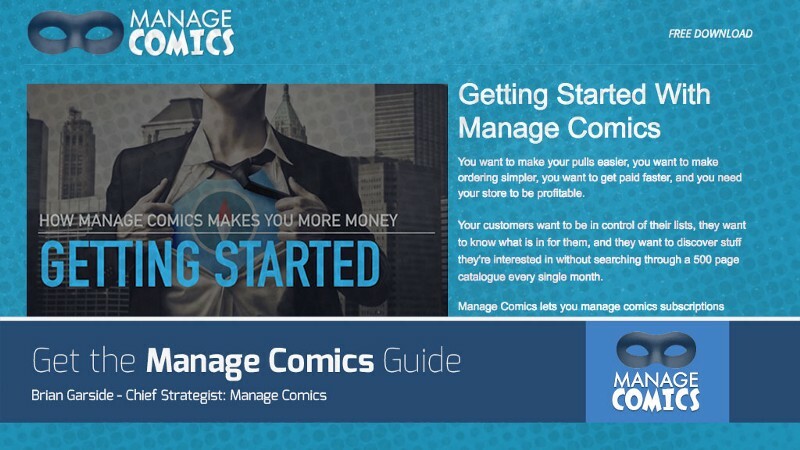 Get the free Manage Comics guide, it’s 32 pages of information about transforming your comic shop into an online powerhouse!